Here, and are respectively and orthogonal matrices, and is an matrix with the same dimensions as . The off-diagonal elements of the matrix vanish, and its nonzero diagonal elements are called the singular values of . The number of nonzero singular values is the rank of . This singular value decomposition or SVD of a matrix has many wonderful properties and a wide range of important applications. The SVD is reviewed by Strang (1993) who describes how, associated with each matrix, there are four fundamental subspaces, two of and two of . The picture he uses to illustrate the action of on those subspaces is reproduced below. The four fundamental subspaces involved in the action of the matrix A (from Strang, 1993). SVD provides perfect bases for the four fundamental subspaces. The first r columns of form an orthonormal basis spanning the column space. Likewise, the first r columns of , or rows of , span the row space. 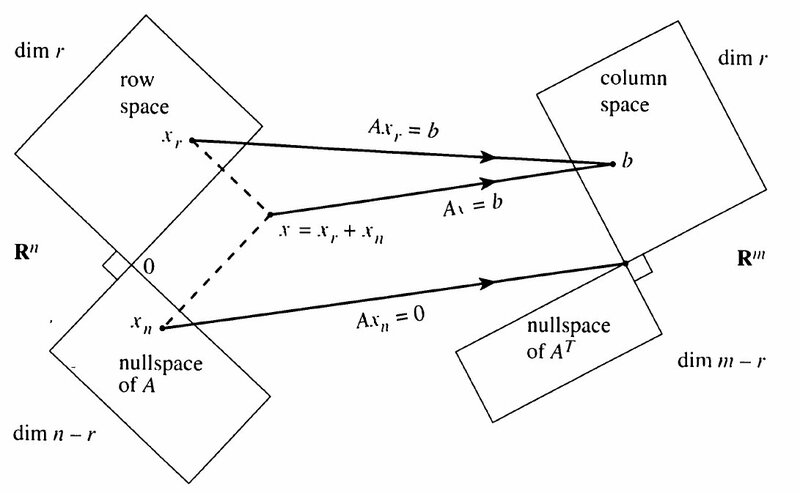 The remaining m-r and n-r columns form orthonormal bases for the null spaces of and . SVD has a wide range of applications in pure and applied mathematics and statistics. We will describe just one application, its use in image compression. This is known as an outer product expansion, and each term is a rank 1 matrix. Imagine a satellite image comprising 1000 x 1000 pixels. The brightness of each pixel is described by a single number, so 1,000,000 numbers must be sent to transmit the image. However, there is often redundancy, and SVD allows us to exploit this. The redundancy manifests itself in terms of small singular values. If we need to retain only the first 50 terms in the outer product expansion, then only the values in need to be sent. That is, 100,050 numbers, so the transmission time is reduced to about 10%, a substantial saving. 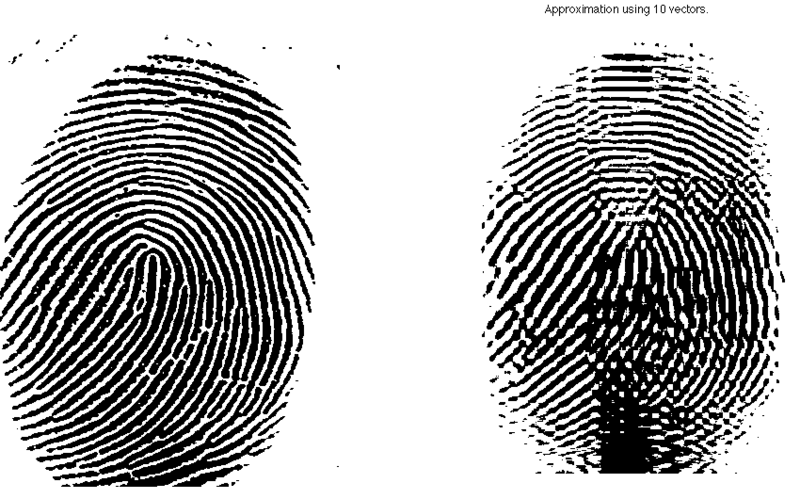 Original fingerprint image (left panel) and compression to rank 10 (from website of John Burkardt, FSU). 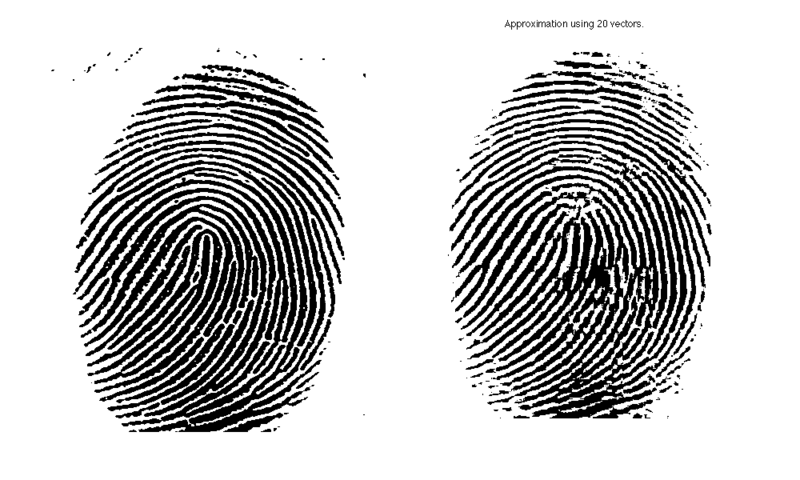 Original fingerprint image (left panel) and compression to rank 20 (from website of John Burkardt, FSU). 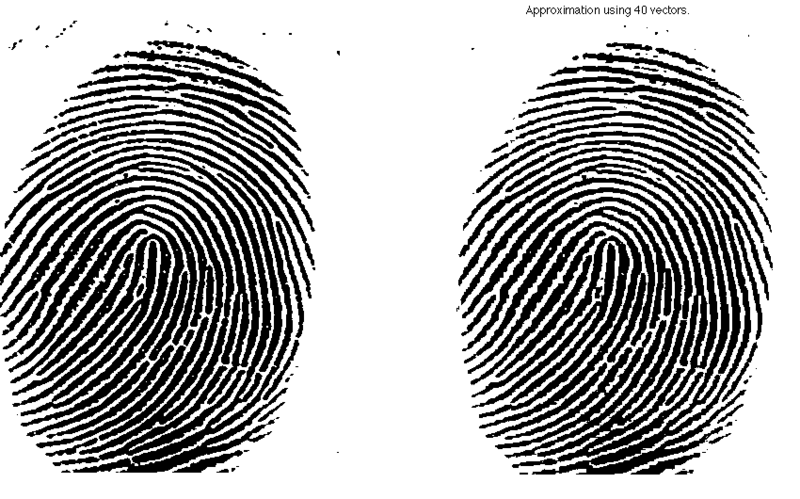 Original fingerprint image (left panel) and compression to rank 40 (from website of John Burkardt, FSU). The original image was 400 x 480 pixels, so 400 singular vectors would be required for an exact reproduction. The image on the right panel of the bottom figure uses only 40 singular vectors and still manages to produce the essential features of the original image. It is clear that, although they have a great deal of fine detail, fingerprint images can be effectively compressed using SVD. This is just one of a multitude of “singularly valuable” applications of SVD. What are the eigenvalues and eigenvectors of ? To what form does the SVD reduce when the matrix is square and symmetric? Reference: Gilbert Strang (1993): The Fundamental Theorem of Linear Algebra. Amer. Math. Mon, 100, 848-855.